MVT Cabin Club: This Just Happened! A few weeks a go I was at the Georgia mobile class and had a discussion with the students, as is often the case, this time about TacGun. It became obvious to me quickly that people did not really ‘get’ what TacGun is. I have written previous blog posts and done ‘Max Talk’ videos on the subject, but it is of course a new concept. Will I do any better today? Some years ago, I read an article that talked about the mindset of typical tactical enthusiasts (as well as preppers). In short, these individuals could learn to become very proficient in individual shooting skills, and amass large stores of supplies, but they were still individuals. Eventually, we all need sleep. In the worst case scenarios, individuals will be overrun by mobs attacking when least expected. I grew up in South Florida. I’ve lived through several powerful hurricanes, including Andrew, Katrina, Wilma, and others. While going without power for two weeks following a storm, someone kicked in my neighbor’s door and stabbed them 17 times. It took hours for the police to respond. We’ve all seen what happened when Katrina hit New Orleans, or what happened recently in Houston. Puerto Rico is still in rough shape from the recent storm season. I’ve lived in places with blizzards, fires, earthquakes, and other natural disasters. My prior profession also gave me unique insight into the “what ifs” of the world. After that, you come to accept that there will be situations where the veil of civility drops and you are on your own. At least for a while. I’ve seen Max’s articles on and off for a long time. It was his old posts that first got me rethinking my battle belt configuration. Max shares a similar background to most of the well-known tactical trainers. However, he gained notoriety through the prepper market rather than the tactical. In a way, that makes a lot of people cautious about his courses and writings. There is a negative undercurrent of “militia training” surrounds teaching civilians small unit tactics that doesn’t sit well with a lot of people. There is a definite stereotype associated with that idea, and most folks in the tactical market avoid it. That said, in talking with him during breaks, Max has been distancing himself and his school from that image. He wants to attract a more professionally-minded tactical audience. This group invests in quality equipment training, and fitness. They aren’t trying to be a bunch of Walter Mittys, just people developing skills. The message I noticed all during class was that this had nothing to do wth politics. In fact, I can’t recall any political comments on the part of the instructors whatsoever. Any discussion of motivation focused on teaching people a more complete tactical skillset. More still, a lot of discussion centered on how to improve the courses and training. The courses he offers, as well as the supporting events, are part of an ecosystem known as TacGun. This philosophy focuses on developing well-rounded citizens who with not only the ability to shoot, but the ability to function as a team. That also includes demonstrating leadership and work towards the high level of physical fitness. Those who prove aptitude in these courses sometimes get the opportunity to act as OPFOR when US Army SOF groups come train at the MVT facility. From talking to those who have had this chance, the lessons learned and camaraderie are striking. I, for one, think that would be an awesome opportunity for anyone interested in tactics. We teach Small Unit Tactics (SUT). SUT is so much more than the minutiae of weapons manipulation on a square a range, however flashy and cool you make it look. 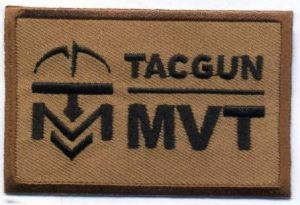 Thus, MVT (TacGun) training takes SUT and uses it a vehicle for training that encompasses leadership, teamwork, communication, physical and mental fitness, and all these valuable skills which will help you today, in the here and now, absent collapse or disaster of any sort. It is true that the whole ‘militia’ thing is a PR problem for professional civilian-oriented SUT training. It gives a bad name to anything camo or SUT. MVT runs professional SUT classes, and we have active duty military train at our facility. At the same time as that, many ‘mainstream gun guys’ are simply not physically capable of SUT. Many of the types who would do great at SUT and the challenge of TacGun, will not be involved with guns, Many of those are crossfit types. Even GoRuck types , who would on the face of it be ideal candidates, may be put off by militia or prepper connotations associated with any sort of SUT training. GoRuck now runs flat range firearms classes, and I suspect that this is as far as many are prepared to go. It strongly appears that due to negative associations, many will not countenance SUT training. They will do flat range ‘tactical’ training all day, but not real SUT. And real SUT is where the fun and challenge is at! And among all this, what is people’s biggest complain around the ‘prepper’ or ‘survivalist’ world? Other than the $25 per year annul cost of the MVT Forum, it appears to be the inability to generate any sort of team, especially trained team. Where is the trained and physically fit tribe? No one has one. Unicorns. This is precisely what TacGun is designed to do. It is designed to make SUT more of a sport / hobby type activity, separated from politics, prepping, paranoia and conspiracy theories and all that. You can also run competitions or events, such as force on force, shooting competitions, 2 Gun events, run n’ guns etc. It is important to note that TacGun is not all competition – many get stuck on this point, not understanding that even the activity of TacGun (i.e. training SUT) is an activity with the training benefits listed above. So does your SUT training, or what we do at MVT, really change a lot given that is is rebranded as TacGun? Not really, other than perhaps throwing in a competition or two here and there. And that is the point: we train SUT for the real benefits. If you can run TacGun events and brand it as such, you may find a lot more people willing to do it, than before when you scared then all off with conspiracy talk about Lizard People, etc (I jest). TacGun is designed to bring more people in the SUT, and allow you to network and build team off of the back of that. Because in fact, what we do at MVT, whether it be live fire or force on force classes, is REALLY COOL. It is way cooler than airsoft or paintball, and all that. It is way cooler than limiting yourself to the flat range. TacGun is what we do at Max Velocity Tactical: Tactical Training. TacGun is our hobby, our pastime, our sport if you like. We are TacGunners. We do not limit ourselves in our training, and our training has immense benefits for us in the here and now, both in our personal and our professional lives. What does TacGun training involve? As TacGunners, we train in current combat tactics, techniques and procedures (TTPs), taught by experienced professional soldiers who are top tier instructors. Current Special Operations Forces (SOF) also train at MVT using these TTPs, and your training is modified only by differences in civilian equipment and operating environment. You can TacGun by coming to MVT classes. This takes the form of a selection and mix of tactical training, leadership, physical fitness, live fire and force on force events, some of which focus on training, some on competition, and some are a mix of both. Force on Force Team Tactics weekends are TacGun events which mix training, personal development, fitness and competition. These are excellent entry level options into TacGun, with no live fire safety concerns for the new participant, where you will receive challenging training and be guided by more experienced TacGunners. Look for TacGun Force on Force weekend events on the calendar – these are an excellent way of getting into tactical training. As a TacGunner with training under your belt, you can run your own TacGun events and training with your own group on your own range or property. This can take the form of live fire drills or even airsoft force on force team events. It is important to specify that TacGun events utilizing UTM or airsoft differ from actual airsoft or paintball in the level of TTPs and teamwork deployed by TacGunners. This is real tactical combat training. People arrive at TacGun via many routes. It is clear that in these uncertain times, TacGun offers real tactical training that can be utilized to defend yourself and your family. However, TacGun is not simply an activity aimed at emergency situations, but is for the here and now, with immense personal and group benefits. Here at MVT, we believe strongly in Liberty and the right to keep and bear arms, without which TacGun would not be possible. Other than that, we are not a political activity or organization. TacGun is an activity for all responsible armed citizens. TacGun does not suddenly make what we do here at MVT into a ‘sport.’ MVT training is TacGun. 1) More focus on which teams win in specific TacGun events such as Force on Force Team Tactics. These will remain as they are as training and competition events, we will just focus a bit more on the competitive side, perhaps with prizes. 2) The TacGun Challenge. Tactical events will be designed to gather scoring metrics on a 4 person team competition basis. So what about this sporting thing? TacGun can be explained as ‘Adventurous Training.’ These are activities that are conducted due to their direct impact not only on tactical skills, but also for the benefits to character, team work and leadership development they provided. So, for example, you may climb a mountain to experience climbing the mountain, not to see who got there first, but it would be a hard day on the hill. Thus, sports/activities that may have no obvious scoring metrics, other than success at the task. A sailing passages in rough weather not as a race, but to work together on the crew and thus achieve the objective, such as a night passage. That is what adventurous training is, and TacGun is in that same spirit.